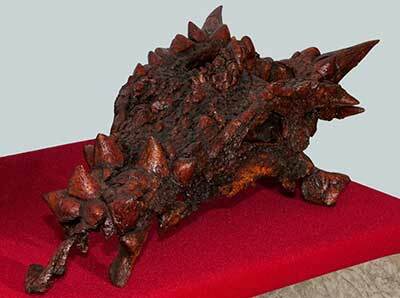 The Dracorex Hogwartsia is known from one nearly complete skull and other fragments. It was discovered in the Hell Creek Formation in South Dakota by three inexperienced paleontologists and donated to the Children's Museum of Indianapolis in 2004 for study. It wasn't until 2006 that the dinosaur was officially named the Dracorex by Bob Bakker and Robert Sullivan. However Jack Horner, a renowned paleontologist studied the dinosaur and concluded that it was a juvenile Pachycephalosaurus. This, however, is difficult to determine due to the fact that many Pachycephalosaurs do not develop full head features, like the bone dome, until they are older. It resembled the modern vision of a dragon with its flat head, long snout, and spikes sticking out the back of its head. Its name was inspired by the young visitors to the Children's Museum of Indianapolis and by the Harry Potter book series by J. K. Rowling.